What are Fish Finders and How Do They Work? What is a Fish Finder and How Do They Work? A fish finder is a device which uses sonar to send out signals under water. From the signals that return, the device transfers this information into an image. This image will display what is happening under the water. The image will show what the bottom looks like and any objects. The objects you will be most interested in will be the fish. The image will give you an idea of how many fish are down there, and the depth and fish finders can often give you water temperature too. A fish detector can even indicate the type of fish you are looking at beneath you. Simply, people use fish finders to find fish. They make it much easier to locate rich fishing areas, and you can use waypoint maps on a fish finder and GPS to record these areas and return to them. Gone are the days of dangling your pole and line off the edge of a boat and hoping for the best. Top rated fish finders often come with apps so you can save information and update your social media. There is also a whole host of other great features you can access from the top of the range fish finders, like side imaging. CLEARVÜ SCANNING SONAR - Shows you more of what is in the water around your boat. This high-frequency sonar gives near-photographic images with detailed representations of objects, structure and fish. CHIRP SONAR - CHIRP sends a continuous sweep of frequencies which provides a wider range of information. CHIRP sonar is able to create crisper fish arches with better target separation. How Does a Fish Finder Work? How do fish finders work? Fish finders use transducers to send out sonar signals. When this signal reaches an object under the water, the sonar wave takes an estimate of the size of the object and the depth. The object could be the floor, fish or something like a log or a rock. The sound wave is returned to the device like an echo, and the information is fed into the apparatus. The information which is fed back to the instrument is used to create an image of what is going on in the water beneath you. This image is then displayed live on your screen for you interpret. Lots of fish finders use more than one frequency to give you a better view depending on the situation. Higher frequencies give you a narrower Cone Angle, providing an excellent level of detail. Lower frequencies allow greater depth penetration, but the longer range will limit sensitivity. Most fish finders have built-in GPS Capabilities, enabling you to plot your location on waypoint maps and easily navigate around. These devices also provide information such as the temperature of the water and the speed you are traveling at. This information combined will help you get the most out of your fishing experience. If you are new to using a device like this, you may want to read up on how to read a fish finder. Interpreting the information you see on the screen before you, will take some getting used to if you aren’t a seasoned user. But once you have got the hang of it, you will be fishing like a pro in no time. One fish finder can differ substantially from another. There are lots of various kinds of fish finders, with different features. The type of fishing you are going to be doing will determine which of these functions you are going to be looking out for. 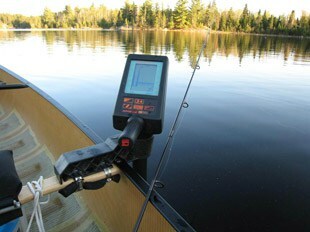 If you are going to be fishing in the shallower water, you will want a device with a higher frequency (around 200 kHz). Higher frequencies work best in shallower water, and they give you a high level of detail. They send out a greater number of waves and can pick up smaller objects in the water around you. If you are going to be fishing at a greater depth, you will need to look for a device with a lower frequency. Lower frequencies can travel greater distances, so if you are fishing deep, this will work best for you. As the waves are being sent out less frequently, there won’t be such a high level of detail. Your salt water fish finder will need to be a lower frequency option, to allow you to see down to the depths. An ice fishing fish finder needs to have a wider cone angle so you can see what is around you, as well as directly beneath you. You will want your device to be both depth and fish finder to enable you to fish effectively. A fish finder depth finder will be incredibly useful when fishing in areas you are not familiar with, as they also show you how far away the bottom is. This will mean you can see if you are entering shallower waters and you will see if there are any obstacles. If you want to find the best kayak fish finder, you will want to select a portable option. There are lots of small and light fish finders out there that you can easily transport in a kayak with you. They often come with suction cup mounts, so you can easily attach them to your boat. If you are looking to move around and navigate to different spots, you will look at a fish finder GPS combo. Fish finders with GPS give you the option plot spots on a waypoint map, enabling you to easily navigate back to good fishing spots. Most fish finders can be easily installed with minimal trouble and technical knowledge. A portable fish finder super easy to get started with, as all you need to do is turn it on and go! Many of them are hand held, so there is nothing you need to do. Some also come with a simple suction cup to allow you to attach them easily to your boat. If you have a device which isn’t portable, you will want to install your fish finder from land. Many fish finder will come with a mount to attach to your boat. From there, you then place your fish finder in the mount, making sure the power leads reach the power supply. You will also need to mount the transducer, and be careful to make sure this reaches too! You don’t want to go to all that work only to find out the wires don’t quite reach. How to Use Fish Finders? All fish finders will work slightly differently, but the set up will be similar, and they will all provide the same basic information to you. You can use your device for much more than only seeing the fish beneath your boat. Using your fish finder in conjunction with the chart plotting function will help you get the most out of your device. Recording your GPS data will allow you to return to a spot at a later date and track exactly where you have been. Because fish finders measure the depth of the water and show you the bottom of the water you are in, they are perfect for keeping an eye on hazards. They will show you if the water you are in is getting shallower; help you avoid running aground. They will also be able to show you objects in the water, like logs or rocks that you may not have been aware of. 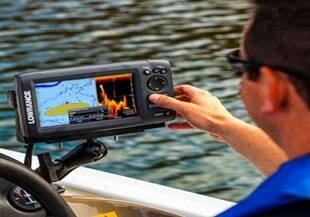 What are Side Imaging Fish Finders? Fish finder side imaging quite simply shows you what is to the side of your boat, as well as what is underneath it. Side imaging fish finders use a particular type of transducer, which used two sonar beams (one on either side of the boat). These two beams are aimed at a right angle to the side of the boat, and look out to the sides instead of downwards. This type of sonar will show you much more than your traditional fish finder. It sweeps a far greater area and will give you a detailed image of everything around you. This will help you place bait better, and with better place bait, you are more likely to get a bite. With regular sonar, it is possible that you may miss lots of good fish, as you cannot see what is around you as easily. 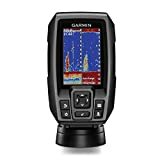 The best side imaging fish finder will afford you a much higher visibility of the fish to be had around you, and will, therefore, allow you to catch more. Side imaging also allows you to see and differentiate between objects. With ordinary devices, you may not be able to tell the difference between a fish and a fallen tree. But, with side imaging, you will be able to quickly determine what the objects are around you. A fish finder is a great tool for anyone looking to get more from their fishing experience. By providing you with information, a fish finder helps you locate the best spots in which to fish and helps you have the most fun. Fishing with a device like this will make fishing a whole lot easier. Are Crossbows Legal in Your State? What are the Best Crossbow Arrows?